Island peak climbing is one of the most famous peak climbing in the Everest region. 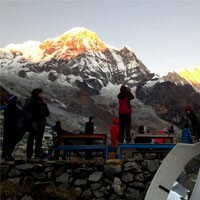 Island peak climbing itinerary is trekking to the Everest base camp and climbing the peak following to the Imja valley. Island peak climbing is one of the trekking peak climbing in Nepal. This Island peak climbing itinerary starts after a scenic mountain flight to Lukla and trek all the way to the EBC and back to climb. During the trek to the Everest base camp, you might be well acclimatization and ready to climb. Remember us for your Island peak climbing with the Everest base camp trek, Cho La passes Ebc Island peak climbing, three passes Island peak climbing itinerary and only island peak climbing. Frolic Adventure makes the best and suitable island peak climbing itinerary as per your order. You will be picked up from Tribhuwan international airport Kathmandu by private transport and transfer to the Hotel. Overnight at Hotel. 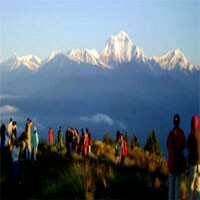 You will have full day Kathmandu city tour with a knowledgeable guide by private transport this day. You will visit four world heritage sites during the city tour. The sites you will visit are Kathmandu Durbar Square, Swayambhunath, Bauddhanath and Pashupatinath. Overnight at Hotel. You will fly early morning to Lukla this morning. The flight flies about half an hour and you will walk to Phakding. During the trek this day, you will see some white mountain, forests, rivers, waterfalls and green hills. You will cross some suspension bridges also this day and pass some Buddhists monuments. Overnight at guest house. Day 04 : Trek from Phakding to Namche Bazar(3440m.) 6 hrs. You will trek to Namche bazar this day from Phakding. You will see beautiful waterfalls, forests, Sherpa villages, green hills and cross many suspension bridges for the same river this day. You will have a steep trail after your lunch this day for about two hrs. Once you will reach Namche Bazar, you will see weekly market if it is Friday and Saturday. Overnight at guest house. You will have a spare day in this place for acclimatization. You will hike up to Syangboche and visit Everest view hotel to see beautiful Everest mountain range and landscape. You will see the most beautiful mountain of this region Amadablam, Everest and many more from this hike and return to Namche Bazar. Overnight at guest house. Day 06 : Trek from Namche to Tengboche(3860m.) 5 hrs. You will trek to Tengboche this day from Namche. Here the trail is easy until Lunch and after Lunch, you will have a steep part to Tengboche about two hrs for the final part. There is a famous and old monastery in Tengboche which you can visit this day. While you will be walking towards Tengboche, you will enjoy the view of a nice mountain range. Overnight at guest house. Day 07 : Trek from Tengboche to Pheriche(4210m.) 5 hrs. This is an easy day of a trek to Dingboche. You will see beautiful mountains, forests, hills, rivers and wild animals this day. You will be higher than the tree lines from this day. Overnight at guest house. Day 08 : Rest day at Pheriche. You will have another spare day Here for your second acclimatization day. You will hike up to Nagar-Tsang Hill for acclimatization walk. You will see the fourth and third high mountain in Nepal this day and lots of white mountains. Island peak also can be seen this day. Overnight at guest house. Day 09 : Trek from Pheriche to Lobuche(4910m.) 5 hrs. You will trek to Lobuche this day. You will see lots of beautiful mountains, Yaks and glacial rivers this day. You will cross Khumbu glacial river this day. You will cross one small pass Dukla pass. On the top of Thukla pass, you can see lots of memorial monuments of climbers. Overnight at guest house. Day 10 : Trek from Lobuche to Gorakshep(5181m.) and hike to Everest base camp(5364m.) 6 hrs. You will trek to Gorakshep this day which final day going up. Once you reach to Gorakshep, check in in the guest house, have quick lunch and hike to Everest base camp and return to Gorakshep. Overnight at guest house. Day 11 : Trek from Gorakshep to Dingboche(4410m.) 7 hrs. You will climb to Kala Patthar early morning and back to the guest house for breakfast and you will trek down to Dingboche this day. Overnight at guest house. Day 12 : Trek from Dingboche to Chhukung(4730m.) 3 hrs. You will trek short day this day to Chuukung and hike up to Chhukung Ri for another acclimatization walk and see nice view. Overnight at guest house. Day 13 : Trek from Chhukung to Island peak base camp(5200m.) 3-4 hrs. You will trek to Island peak base camp this day. and you will have climbing practice in here. you may also walk around to see Imja ice lake. Overnight at tented camp. You will summit this day from base camp. Enjoy the climbing and nice view and return to the base camp and trek to Chhukung. Overnight at guest house. Day 15 : Trek from Chhukung to Tengboche(3860m.). 5 hrs. 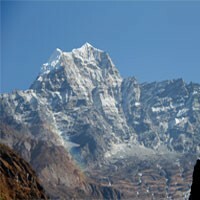 You will trek back to Tengboche this day and Overnight at guest house. Day 16 : Trek from Tengboche to Namche Bazar(3440m.) 4-5 hrs. You will return to Namche bazar this day. Overnight at guest house. Day 17 : Trek from Namche to Lukla(2885m. ).6-7 hrs. This is the final day of your walking. You can celebrate the last day of the mountain here. Overnight at guest house. Day 18 : Fly to Kathmandu from Lukla. You will have an early morning flight this day and arrive in Kathmandu. You will be invited for farewell dinner with Frolic Adventure this evening. Overnight at Hotel. Day 19 : Free day for your sopping in Kathmandu. You will have a free day in Kathmandu for your shopping as the souvenir if you would like to. Day 20 : Departure to the International airport for your final departure. Frolic Adventure arranges private transport to the international airport for the final departure and says a warm goodbye until our next Nepal visit.